Like many photographers, over the last year I’ve been taking taking tentative steps into the world of mirrorless cameras. Well, to be honest, I’ve been dipping a toe in the mirrorless scene for a good while longer having had a Sony A7, Fuji X-E2 and Fuji X-T1 already but this time was different, both socks were off and I was knee deep paddling about in mirrorless cameras. I’d gone into it half hearted before but that simply doesn’t work. One falter with the kit and you start wishing you had the old trusted DSLR with you instead. There IS a learning curve, no doubt about it, the cameras are similar but also very different from DSLR’s and it will take time to get into using them, as it does with any new bit of kit. With that in mind I strode forward, throwing caution to the wind and bought a shitload of Fuji gear. I walked from Calumet carrying a Fuji X-T1, 16-55mm f2.8, 10-24mm and 55-200mm. I hadn’t even reached the car before buyer regret set in. £2.5k, just like that? What am I doing? Wonder if they will take it back? But, I had good reason, in my mind at least. I had been having specific shoulder and neck problems and carrying about a Nikon D4 and a few f2.8 lenses plus a 150-600 puts some strain on that particular area no matter what kind of bag you use. You could use a roller bag I suppose but hardly practical walking over a muddy field not to mention looking like you were off on holiday every time you went out taking pics. No, the aim here was to lighten the kit and the Fuji X series was perfect in that respect but would it stack up in others, ease of use and image quality being the most important? I’m happy to say it did, on all counts. Having a full kit meant I could leave the Nikon’s at home and really concentrate on using and getting to know the Fuji kit. That was the key, previously I had used the Fuji as a secondary kit to the Nikons, never really got to know it and it never quite clicked, this time it did. I’ve shot nothing but Fuji X series since March 2016 and don’t intend to switch back to DSLR’s. I’ve since added a Fuji X-Pro2 and Fuji 100-400mm and a 2x tele all of which have been brilliant but the real jewel in the crown is the Fuji X-T2, this camera is quite simply one of the best I have ever used. It’s early days with it yet but by all accounts, from first impressions, it’s an outstanding bit of kit. So why didn’t I go Sony and get that nice full frame sensor? Well, I wasn’t overly impressed with the Sony kit I tried, there was a horrendous flare issue with the Sony, which could have been either the A7 or the 70-200mm f4 but whatever it was, it killed Sony cameras for me. The E mount lenses are also big, they have to be for that FX sensor so that took away one of the main reasons for switching, weight. Price was another factor, the new Sony f2.8 lenses are eye wateringly expensive, sure the Fuji ones are too but nothing near the Sony prices. So, do I have any regret in ditching Nikon? Nope. Do I have any regret ditching full frame? Nope. Will I switch back to a DSLR anytime soon? Not a hope. Is there anything I can’t do with the Fuji the Nikon could? Not found anything yet. Would I recommend it to anyone? Well, that depends on what you are after. It might not be for everyone but for me it meant I could further without kit weighing me down, it also meant I could take the whole bag with me rather than deciding what lenses to leave behind in the car. The only thing to beware of is the expense. That DSLR kit you have, you probably built up of years of careful purchases. You will want to replicate it with the new kit and you’ll want to do in a matter of months, not years most likely and that will be EXPENSIVE! Selling existing kit will help finance some it but you’ll likely still find some significant outlay. I now believe that these cameras like the Sony A series and Fuji X series are now the future of photography. DSLR’s won’t go anywhere for a while but in 10 years time or so, if the tech keeps moving the way it is just now, we’ll all be using mirrorless cameras and watching Canon and Nikon playing a serious game of catch up. I stumbled across this earlier totally by accident but I can see it becoming a little obsession for a while. An energy saving lightbulb lit up gradually over my head and I ended up going through all the pics taken on Sunday night with the D90 and found quite a few multi shot sequences. These were all in RAW so I had a hell of a lot of processing to do, the trick being to take each sequence and process every shot in exactly the same way, I done this by saving the settings in ACR and applying to every shot in the sequence. Next up with all the shots processed was to order them, as I saved with the default name I just ordered by name. Now, using iMovie on a Mac you simply have to drag all the files in one go into iMovie. From here, highlight all the pics and set the time interval to 0.1 or 0.2s in the clip adjustment menu (little blue drop down in the bottom the highlighted pic. Now pick the Cropping, Ken Burns and Rotation menu, whatever Ken Burns is it’s a pain. Switch all the shots to Fit and click done. This will stop that stupid zoom in thing on every shot from happening. You might also have to go into File — Project Properties and change the Initial Photo Placement drop down to Fit in Frame. With this done you can now preview the movie and make any further adjustments. Now go to Share — Export Movie and pic the best option for you. I picked the 1080p HD option but beware, 167 12mp frames ended up as a 70+mb .mov file. The .mov is fine for upload to You Tube, Facebook and Flickr so I would assume it’ll upload to other video services too. And that’s about all there is to it, I’ve also now applied this to sequence of shots meant for a star trail that shows the movement of the stars once you give it the time lapse treatment. 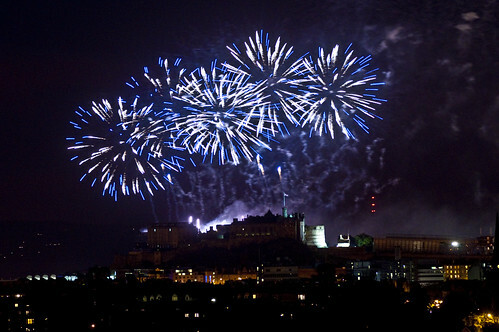 Well, that was probably the most challenging night I’ve ever had shooting fireworks in Edinburgh. Fireworks are never particularly easy but add in a fairly brisk westerly breeze and it makes it even more of a challenge as the burst gets blown in the wind leading to nasty trails. Not the best but I got around it to an extent. 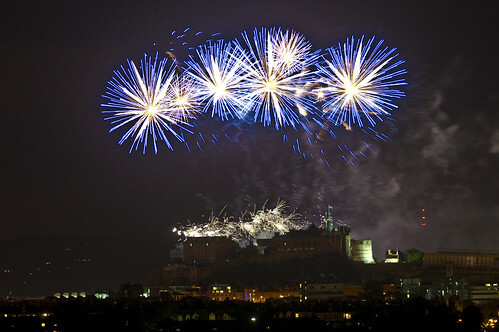 The location of choice for the 2012 Virgin Money Fireworks Concert at Edinburgh Castle was the old favourite of Blackford Hill. 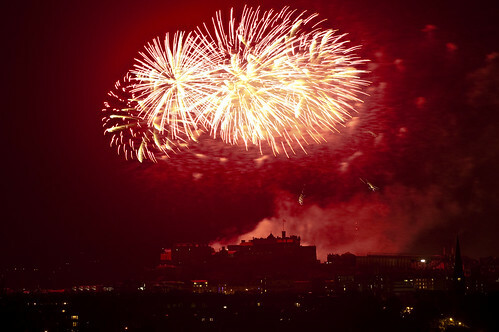 I went for Blackford over the Crags this year as with the wind coming from the west the smoke from the fireworks would drift towards the Crags but off to the South, Blackford would be fine. Blackford has the added advantage of being flat onto the back of the Castle so you are shooting the bursts as they are, rather than through them which you do from Calton or the Crags. Inverleith is the same as Blackford but looks directly onto the Front of the Castle, arguably a better location but Blackford is higher too which I think helps. The setup for this year was again 2 cameras on the go. The Nikon D7000 had a Nikon 18-200mm VRII on this year for some wider atmospheric shots and the D90 had the Sigma 70-200mm f2.8 for those closer in shots, both tripod mounted (obviously) and both with remotes attached. The D90 was set to high speed drive so with the remote engaged I could leave it to snap away while I manually triggered the D7000. As I said earlier, the wind was a real issue. Any wind causes the fireworks trails to trail with the wind too leaving you with messy trails, the solution I used was to try and keep the exposures short, against the conventional way of shooting fireworks. Most exposures I kept down to 1s or under, especially on the closer in shots, wider could stretch a bit longer and I wanted the lights from the city too. The upshot of this wasn’t the glowing long trails of usual shots but the shorter trails and quicker exposure combated the nasty drift from the wind. In this mode I was able to rattle off nearly 600 images from the 2 cameras which gave me plenty to cherry pick from to get the best. All in, not as good as previous years but I certainly handled the conditions better than I have on previous windy nights. 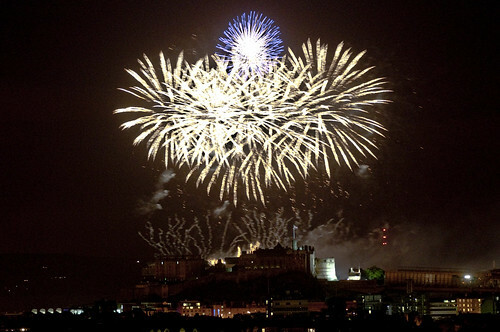 Just as an aside, I know the whole display was geared up to be viewed from Princes Street but a lot of Edinburgh watches it from other locations too. This 2012 display was pretty poor from any vantage point that didn’t look onto the front of the Castle. Long gaps of nothing visible, and I’m talking 5 minutes upwards was the order of the night and certainly not as good as previous years. I even missed the finale as there was a massive gap with nothing notable happening, not until I packed up and was halfway back to the car at least. 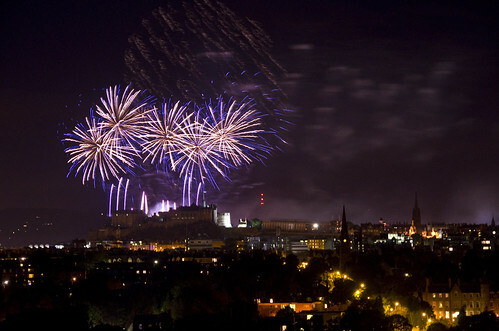 Roll on the Hogmanay fireworks and hopefully no wind! 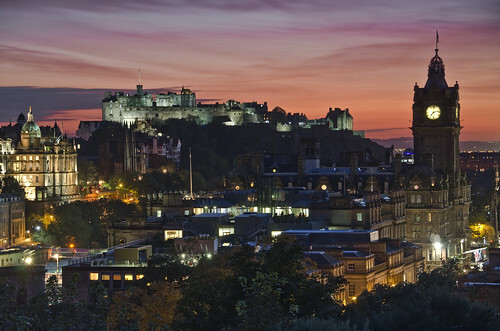 or even head over to Facebook to http://www.facebook.com/RealEdinburgh and hit the like button and see them there was well! 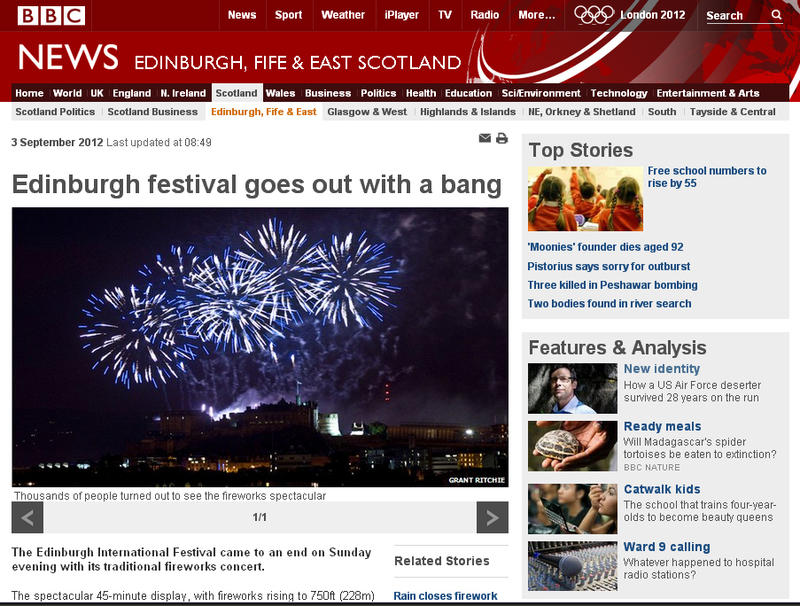 I even got the lead shot on BBC News this year too! 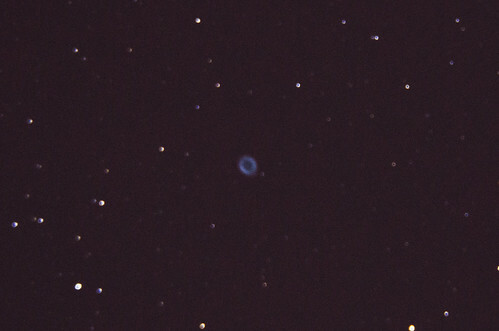 My aspirations in Astro-photography finally bit the dust last week or at least licked the dust. After a frustrating night attempting to find the Andromeda Galaxy by star hopping, or more like star limping it has to be said I all but packed it all in. All I had to show for 2 hours out with the scope was a sore back and heightened blood pressure. What had I seen? Stars, by the bucket load but I had no idea what I was looking at and therein lay the problem. I’d bought my scope at entirely the wrong time. I got it as the darkness retreated and potentially even worse; all the planets departed the night-time sky into the early morning. When I first got it a few hours just attempting to image Venus, Jupiter, Mars and the Moon was more than enough to keep me interested. Take all those out the equation and I was left floundering trying to find deep space objects, which in the lighter summer skies was even harder. So, something has to change. I needed a GOTO mount otherwise I’d never see anything. I also decided the Skywatcher Explorer 200P on the EQ5 wasn’t for me. It took too long to setup, was too big and too heavy and I was already starting to skip clear nights through simple couldn’t be bothered-ness with all the mucking about to get setup. The solution therefore was to sell the 200P and EQ5 and look for something different and so last week the scope and mount went to live with its new owner and I started a hunt for a replacement. I had decided against the GOTO upgrade for the EQ5 as it wasn’t addressing the issue of the scope size and weight. 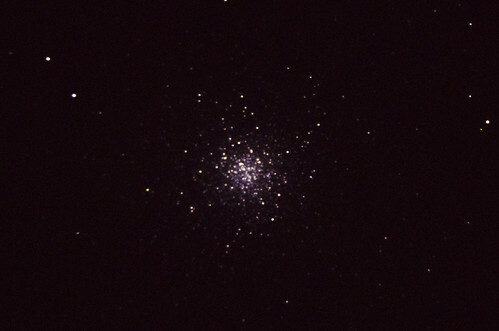 I eventually settled on a Celestron Nexstar 5SE on the full GOTO Alt-Az mount. I know the Alt-Az isn’t the best for photography but its fine for me just now and the mount has a basic built in wedge. I won’t be doing any minute’s long exposures but I should be able to get something out of it. At F10 nowhere near as fast as the 200P at F5 but it’ll suffice for what I want to do initially. What’s important here is I get a scope that easy to handle and easy to setup so I can learn. Any images I can get that come along will be a bonus. In fact, when Jupiter come back to the night sky it might even be better than the 200P. The new scope arrived yesterday and I have to say from first impressions I’m very pleased with it. The whole package seems better built than the Skywatcher stuff. 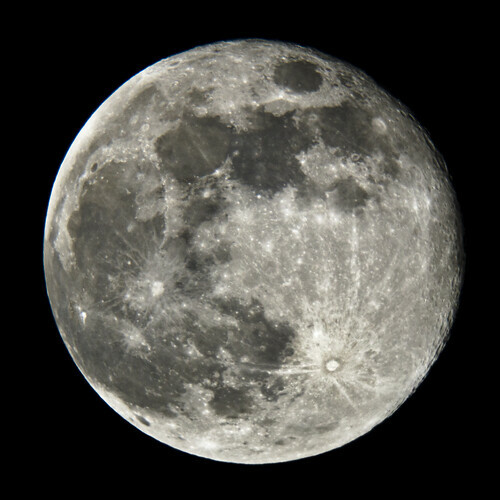 The stock 25mm plossil eyepiece is nice and bright and much better than the Skywatcher 25mm item. Setup was easy enough, as was the align once I realised I had my position set at Louisiana USA, not Edinburgh, Scotland and I actually got to see some stuff! My align was far from perfect just using a 2 star align but I did find the Double Cluster, Ring Nebula and Great Cluster in Hercules, a massive improvement on what had gone before. Sadly dew was a major issue and I didn’t have a dew shield fitted which ended the session earlier than I would have liked so I never hooked up the camera but that’s now sorted and I’ll have the D7000 hanging off the scope at the first opportunity next time around. In a true Astro-photography sense I’ve taken a step back but in doing so I’ve rekindled interest and that above all is what’s important. It’s pointless having a million pound setup if you can’t be bothered to use it. They say the best scope you’ll have is the one you use and for now at least, I’ll be using the 5SE at every opportunity! 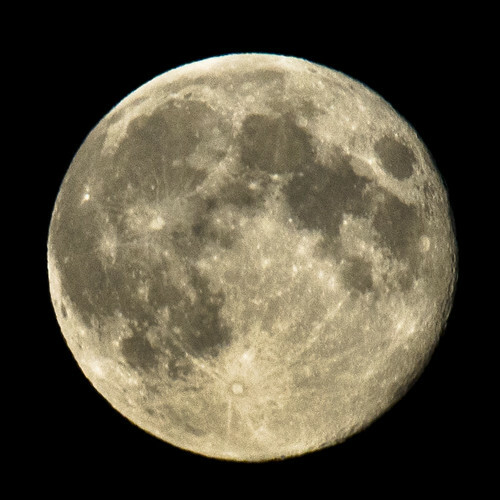 I’ll leave you with a few shots from last night, none of these where through the 5SE after the dew got to it, these were all with my D7000 fitted to a Sigma 70-200mm f2.8 and 2x tele, Samyang 500mm reflector lens or my mates Skywatcher Explorer 200PDS on an HEQ5 Pro mount. Imagine if Nikon or Canon updated like Apple? By this time tomorrow, for the first time since 2008 I won’t own any of Apple’s iOS devices. iPhone will be replaced with a Samsung Galaxy S3 and my original iPad will be replaced with a Google Nexus 7. So why, considering my VERY pro Apple stance? Basically, I’m fed up feeling ripped off by Apple. Long gone is the company that seemed to put the user experience first. You paid a premium for Apple products but on the whole they WERE premium products. Everything from the packaging to the use of the item was so obviously carefully thought out; I at least, perceived they were worth the extra cash. Since Apple became the world’s richest company though there’s been a distinct change. I’ve had 3 MacBook’s now but my latest 13″ Pro is by far the slowest and least reliable I’ve owned. There’s nothing wrong with it, it’s simply not the product it used to be. My older Black MacBook running OSX10.6 is noticeably faster than the i5 machine running 0SX10.7. That shouldn’t be right! Then there’s the iPad, the crowning turd of Apple’s greed. 2 years ago I bought the original iPad. £500 for a 32gb WiFi model was pricey but hey, this was Apple and it would be worth it. Was it though? At the time the iPad was unique so it was a pretty amazing bit of kit but less than 12 months later along came iPad2, faster and sleeker. That was the first signs of something wrong. Occasional apps that would only work on iPad 2. Few and far between but there already not supporting the original machine less than 12 months after launch. Then came the new iPad, less than 24 months after I got original iPad and with it an announcement that iOS6 when it launches in the autumn won’t be supported on the original iPad. What this means in real terms is that your original iPad is very much dead. Sure, it’ll still work but this is when the flood of iOS6 only apps will start to appear and owners of that original iPad will start to get left behind. This is now the Apple way, force the hardware upgrades by means of software updates that cripple the original device. Remember iOS4 on the original 3G iPhone? iOS4 ran like a dog on the 3G so the world went out and bought iPhone 4. You can be sure iOS6 will run like a dog on iPhone 4 so the world runs out and gets iPhone 5. I’ve had enough of this and I’m getting off this particular bandwagon. Now, to the original point of this post, imagine if Nikon or Canon behaved like that? I could go out now and buy a Nikon D4, the newest of the new and stick on a 30 year old Nikon lens and it’ll work. I could go out and buy a brand new Nikon lens and stick it on a 12 year old D70 and it’ll work. Buy a Nikon camera and a Nikon lens and it’ll work forever, or at least until components fail. It won’t stop working because Nikon want you to buy their new shiny lens rather than your old one that works perfectly well. We expect and demand this of companies such as Nikon or Canon and there’s a lot of brand loyalty out there. If you buy into one system few ever change. There’s no real need to. I have a 10 year old Nikon lens; I paid around £500 for it new. I could, with confidence by any new Nikon body safe in the knowledge that it’ll work just fine, it will in another 10 years time too yet less than 2 years after spending £500 with Apple I’ve got a technological ornament? Nikon aren’t changing mounts forcing me to upgrade, no, they make sure that even if they do make changes previous kit will still work in the way you expect it to. I can even look at my 6 year old PS3, a more direct comparison to an iPad than a camera maybe. I can buy any new game for this system and it’ll work, regardless of the age of the device, it’ll work. That’s value for money, that’s not being ripped off, that Apple, is how you should be treating customers. It’s all very well driving technical innovation but lets not forget those that have forked out their hard earned in these difficult financial times that helped you become the richest company in the world. In the race to stay ahead, Apple may find the tides about to turn, Nikon and Canon however will still be the major players in their field in 20 years time, and I wonder where Apple will be in 20 years time? I’ll also point out that prior to writing this I have owned… Apple Quadra 800, 15gb 3rd gen iPod, white MacBook, black MacBook, 1st gen iPod Touch, 3rd gen iPod Nano, 20″ iMac, iPad, i5 MacBook Pro, iPhone 2G, iPhone 3G and an iPhone 4. If Apple can piss me off they can piss anybody off! It’s gone beyond funny now. Seriously, the Scottish summer has put a major dampener on my enthusiasm for photography this year. There’s only so many pictures you can take of rain soaked Edinburgh before it gets very long in the tooth indeed. I done a blog post a wee while back about not letting the rain put you off, that’s fine when you get occasional rain but not constant heavy rain! I’ve never done a landscape shot for weeks, what’s the point? I don’t need any more shots of Edinburgh with dull grey skies and the camera gear isn’t all that keen on being wet all the time. I’ve never done an astro shot since I don’t know when. What’s the point? Nearly total and constant cloud cover has all but stopped that particular pleasure and the telescope lies gathering dust having only had one brief spell of use in the last 6 weeks or so. 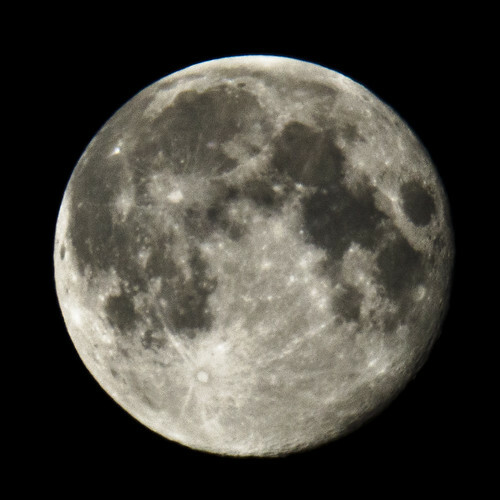 Nearly every visible phase of the moon has been blocked by it being too low to see over the house or more often, thick cloud. Saturn has all but gone and I’ve no confidence at all in being able to see the Jupiter/Moon occulation this weekend at all. I can’t get a clear shot at the sun either, we see a faint glow now and again but it’s not enough to get any sunspot detail. Normally I spend a lot of time in summer down by the Botanic Gardens, not this year. My style of floral photography usually involves unusual angles etc, and lying in wet and mud to get a shot it’s really my idea of fun so that particular pleasure has gone for now too. Macro shots in the woods are out, I usually combine it with walking the dog but there’s so much mud the dog gets caked and it’s a total pain. All I seem to have done for weeks on end is macro insect shots from things I find in the garden, there just doesn’t seem much point doing anything else. It was a brief bit of interest chasing the flooding around Edinburgh at the weekend getting pics but that too involved being wet for nearly the whole day, caked in mud and there’s a sore throat in the post too. Roll on autumn and winter and some decent photography weather!